Search Party isn't your children's scavenger hunt. It's a team-based laugh monster that sharpens both sides of your brain and keeps you all on your feet, working together while competing against other teams secretly plotting to finish ahead of you. Decipher the cunning clues and discover the hidden secrets of your Target Area... while overcoming dastardly challenges. Fred from Accounting... Jill from HR... Giselle from Shipping... that tall red-haired guy... aka, your Clever Opponents! It's a think-race, not a foot-race. Working collaboratively, your group must decide quickly upon a strategy to solve the clues and challenges that yield the highest point total. But you have to keep your head on a swivel, because each part of the game zone you’ve chosen is a potential piece of the clue you are working on. All the while, you can feel your Run Brain Run Game Director lurk nearby, incognito, watching to see how well you work together to complete zany challenges and earn points in the allotted time! So, who will be the leader, scout, scribe, or cheerleader? There is no wrong way to have a good time, but a rival team just rounded the corner and they want to win this game, too! Beating them to the final clue could mean earning extra points and winning the grand prize at the culminating awards ceremony. Search Party lasts about 2-2.5 hours. We can squeeze it shorter if you need. One or more Game Directors (depending on your group size) prepare everything you need to play the game and are there to make sure it all runs smoothly. Download PDF Group Pricing and Game Summaries. 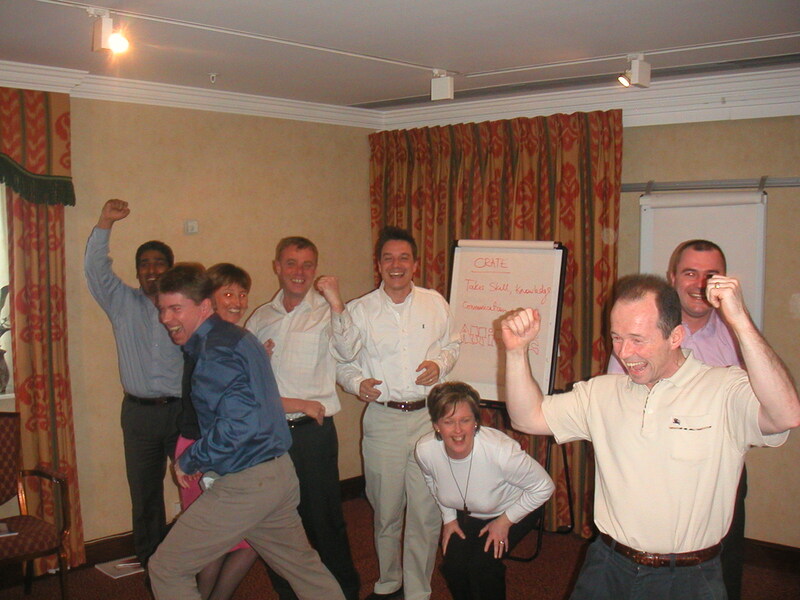 We start with a fun, energetic icebreaker that gets people moving around and laughing - and, cleverly, sorts people randomly into teams of three to eight people (depending on the size of your group). These teams will then compete against each other for the remainder of the event. Teams can get VERY competitive! And competition helps build energy, excitement and incentives to complete the many wacky challenges that lie ahead. Also known as "Stupid Human Tricks," these are activities that involve the entire (small) team, create team identity, and (secretly! Shh!) helps bond the team by building communication, cooperation and trust. We'd tell you more, but that would give you an unfair advantage over the pour souls on the other teams who don't read this. If you selected the HD Video or Secret Agent Challenges, you'll encounter those here. Bwa-ha-haaaaa! We challenge you further with a few dozen cleverly worded clues and riddles that test your powers of deductive and inductive reasoning as well as the depth of your punster IQ. You first have to figure out what the heck we're asking for in said clues. Then we test your powers of observation: you need to find the answer to this riddle somewhere in the environment, then debate amongst yourselves (inevitable) and write down your final answer (no lifelines) on your Game Sheet. Yeah, we never said it would be easy. Want to share this info? Once you're done, or time is up, whichever comes first, you then return to the point of origin to hand in your game sheet to the Game Director. The Game Director then announces the winners, awards "extremely valuable" token prizes, and congratulates you for a job well done. Most people go get something to eat or drink. If you've taken video, we collect the cameras back, hunker down in the office with a 64-ounce Slurple and a giant bag of WinCo Cheese Puff Food Substance, and transmogrify your video onto a format you can use. Then we send it to you, along with that pesky final invoice. "Film at 11" - relive the experience and watch the antics of your competitors later if you add HD video camcorders to the mix with our Gold Package! "Uniquely You" - Go Platinum and we'll customize the game with Secret Agents and clues about you, your company, your boss... we'd better stop there. "Party Party" - Ask us about after-game dinner options, higher-end prizes and a full-on awards banquet. Your Search Party day is just a click away, so Contact Us today to book your game date. May the funnest team win. Get into this game for only $25 per player! You’ll be on your way with a pre-game briefing, Run Brain Run mission packs and equipment with dozens of clues and challenges, Game Director support along the way, and an entertaining awards ceremony with funny prizes at the end of the game. All that glitters isn’t gold, but your pearly whites will when you add HD Video Camcorders to the game. Enhance Basic Package game dynamics, enjoy post-game replays of your finest moments, and watch yourself go viral after we upload the raw footage online within hours. Truly own your Run Brain Run experience when you enhance any of our events with Secret Agents and personalized game design. With enhanced, interactive game play from charActors plus your own Clues or Challenges you’ll be the rock star in your company. Now with more cowbell. Get all the pricing (plus à la carte options) on our Group Pricing page.